We often walk through parks in our busy lives sometimes passing statues, sculptures or monuments we hardly notice. If we take the time to look closely we may see a tribute to an individual who so impressed people they worked diligently to honour that individual, or perhaps what they represented. Such a sculpture stands in Campbelltown’s Mawson Park in honour of the wife of one of Australia’s most admired colonial Governors. This is the story of how that sculpture came to be. In May 2001, Campbelltown and Airds Historical Society had a very special guest speaker, a renowned sculptor who spent his early life in the Minto area, Tom Bass. Tom spoke about his early life, and told that he completed the majority of his major work in the 35 years he lived in Minto. He explained his association with the Society’s founding President Ivor G Thomas and their interest in Governor Lachlan Macquarie, and especially his wife Elizabeth, after whom Campbelltown was named. They shared a dream of a sculpture honouring Elizabeth Campbell Macquarie. 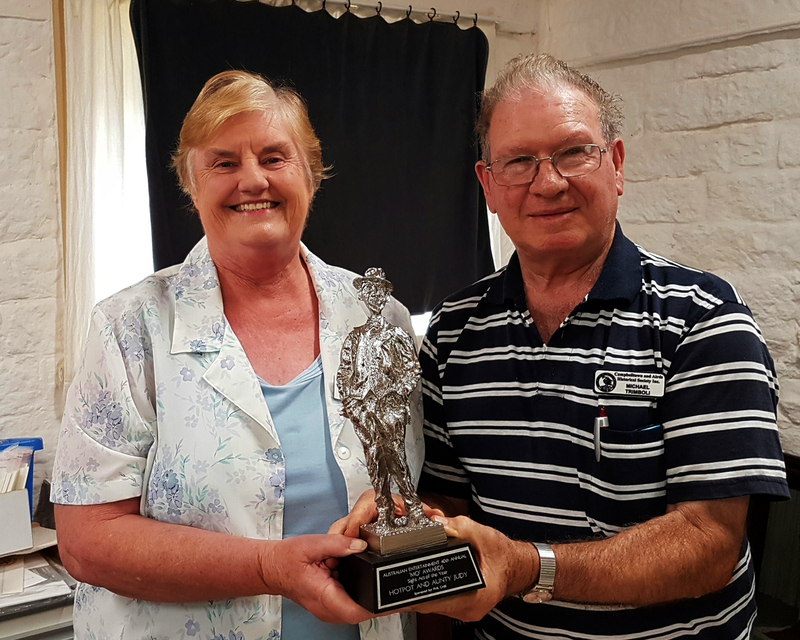 Tom presented the Society with a maquette (a scale model) of the sculpture he was planning for Campbelltown, in the hope that it might engender support. Governor Lachlan Macquarie and his wife Elizabeth play an important role in Campbelltown’s history. Macquarie had named the district of Airds ‘in honour if my dear good Elizabeth’s family estate’. On December 1st 1820 on one of his visits through Airds, Macquarie proclaimed the town of Campbell Town in honour of Elizabeth’s maiden name, Campbell and the Campbell clan. The Macquarie’s were also associated with Varroville. In 1810 the visited the home of Dr Robert Townson. Their son attended the school run by Reverend Thomas Reddall at the home of James Meehan at Macquarie Field. When accompanying her husband on his official visits throughout the district Elizabeth Macquarie is said to have given corms of irises (or flag lilies as they were called then) that she brought with her to the settlers. She also would sometimes put them out on the sides of the road. In later years it was not uncommon to see clumps of these blue and white irises growing on the sides of Old Sydney Road and around the old early settlers’ houses. Tom Bass has taken this story as the focal point of his sculpture, portraying Elizabeth with a sunbonnet, apron and watering can, and placing her in a bed of irises. In a subsequent letter to the society, Tom explained that he hoped to execute a life-size bronze sculpture (213cm high) of Elizabeth, complete with sun-bonnet and watering can, which could be set in a garden of irises in one of the historic precincts of Campbelltown. He estimated the cost would be in the vicinity of $75,000. He also believed this would be his last major work. 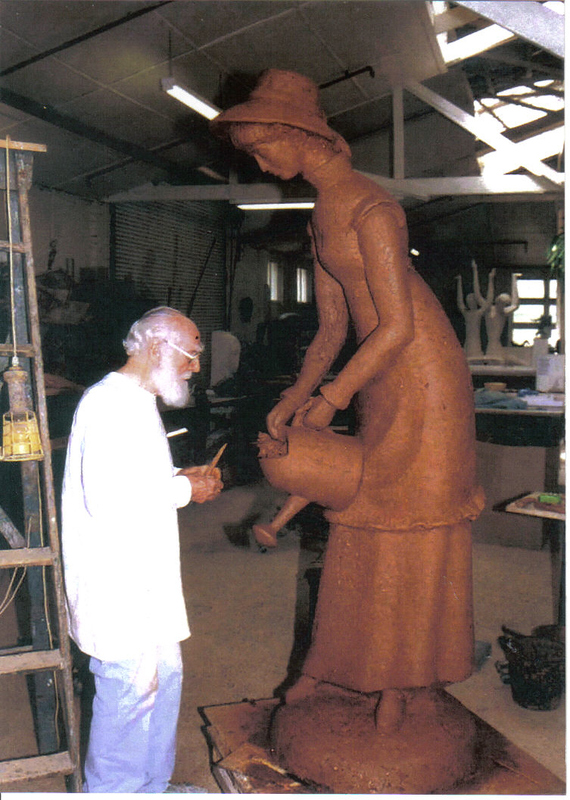 Tom felt so convinced of the value of this sculpture for Campbelltown that he preceded with the making of the full scale sculpture of Elizabeth in clay. In February 2002, he invited members of the Society, representatives from Campbelltown City Council and other interested people to a viewing at his studio at Erskineville. At this function, Tom expanded on his vision of Elizabeth. He offered to donate reproductions of the maquette of the sculpture to raise funds to produce the full-scale work. The sale of the maquettes, together with the Society’s fund-raising and Campbelltown City Council’s significant contribution has enabled this exciting historical project to come to fruition. After the viewing, Campbelltown and Airds Historical Society alerted their members and many other groups in Campbelltown of Tom Bass’ plans. Donations and applications for the purchase of the maquette began. The Society also approached Campbelltown City Council for assistance, and for permission to place the sculpture in a suitable place. In July 2002, Campbelltown City Council gave its approval for the scheme, and has since contributed more than $60,000 towards the project. The first stage of the sculpture had been completed and secured with the making of a latex mould from Tom’s two metre high clay model. The next stage would be the casting in bronze. This was done early in 2006. Fundraising by the Society continued, and a scale model was displayed at Campbelltown Arts Centre to draw attention to the project and to assist with fundraising. It was decided that the sculpture should be placed in Mawson Park, the place where it is thought the town of “Campbell Town” was proclaimed. Tom proceeded to make a model of the garden complete with irises where Elizabeth would be placed. The installation was in conjunction with the significant work that has been undertaken to upgrade Mawson Park. 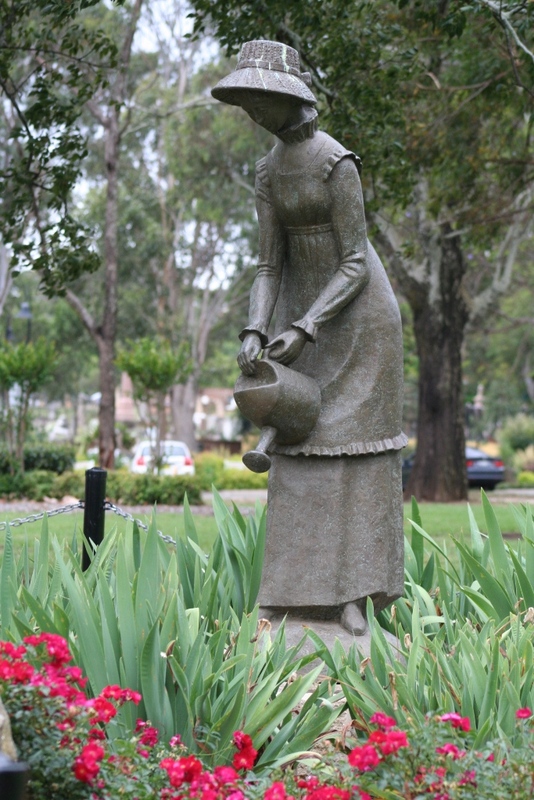 The bronze sculpture arrived in late March 2006 and Campbelltown City Council’s City Works Department placed Elizabeth in her garden setting. An incredible amount of behind the scenes work was needed to bring the project to fruition. Overcoming the difficulties encountered was well worth the effort when the sculpture, surrounded by recently bloomed irises, was unveiled to the world on a sunny morning and the ringing of a bell at St Peters church. Tom Bass’ connection to Campbelltown began when he lived at Minto in the 1940s with his wife Lenore. There he and Dr Ivor Thomas (founding president of Campbelltown and Airds Historical Society) completed one of Tom’s earliest projects, a series of plaques the Society has used to mark heritage sites in the district. At this time he discovered the region’s rich red clay and began using it to make his sculptures. Tom created his sculptures in clay before casting them into more durable materials like copper (via electrolytic deposit in the Minto days) or bronze. Tom took a load of red clay from a hillside near Campbelltown Road when he moved from Minto in the 1970s. He and his students have been using and re-using clay from there for the past 33 years. In 2004 He found another source near the original. Tom Bass’ commissions can be found in almost every state in Australia, as well as in Washington DC. One of his most famous is Ethos, a copper sculpture in the Civic Square, Canberra. His legacy to public sculpture continues through the Tom Bass Sculpture School. A Retrospective of Tom Bass’ work was held at the Sydney Opera House in 2006, and was opened by Her Excellency Professor Marie Bashir AC CVO, Governor of New South Wales.